Consisting of 20 percent mucopolysaccharides, 20 percent protein, 4 percent chondroitin sulfate, and 1 percent fat, Nature’s Sunshine SC Formula (shark cartilage), is a rich source of essential amino acids, calcium, and phosphorus. 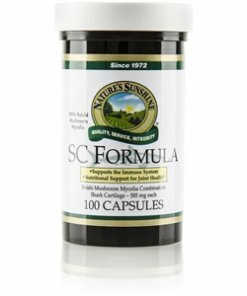 100 percent freeze-dried shark cartilage and reishi mushroom come together in SC Formula to nourish the immune and structural systems. Chemical agents, solvents, and bleaches were not used in the making of this product. No endangered species of sharks were used. Nature’s Sunshine only uses the cartilage from sharks caught for human consumption. 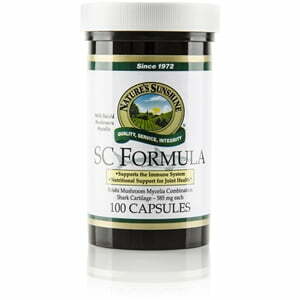 One SC Formula capsule consists of 400 mg of pure shark cartilage and 175 mg of reishi mushroom. Magnesium stearate, gelatin, and water.